I’m From Barcelona have generated a good amount of buzz in the US since their tour last year. While this is their sophomore release, following their 2007 debut, Let Me Introduce My Friends, this record marks their first album for high-regarded label Mute and their official break onto our shores. Who Killed Harry Houdini was highly anticipated and definitely delivers, and it is an uplifting yet grounded pop masterpiece. The record flows effortlessly from song to song despite the changes in tone, proving the band’s versatility. They have achieved a superb balance between upbeat pop songs and slower paced folk infringed tunes. The band has accessibility yet isn’t over the top in terms of pop sensibilities. Beginning with the slow building “Andy,” the album meanders but never strays off course, climaxing with the almost-title-track “Houdini” which rocks out while maintaining their essence. It is the only song on the record prominently featuring electric guitar. The group’s backing vocals remind me of The Polyphonic Spree on their first record, but the whole vibe is more like the sweeping gestures of Broken Social Scene. These comparisons make sense considering the fact that I’m From Barcelona is known for having more than 25 band members. And importantly, the band is not from Barcelona at all; they’re from what is more like a small town in Sweden — a country in which, it seems, there is something in the water that yields musical talent. Instrumentally, the album is quite diverse, with tracks ranging from the quiet violin number of “Rufus,” the closing track, to the bombastic trumpets and trombones of the single, “Paper Planes.” Even though the music often sounds light-hearted, it deals with some serious themes. “Paper Planes” is catchy but speaks of loneliness and isolation in a big city. 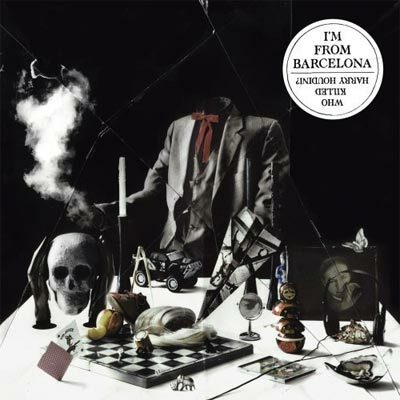 But I’m From Barcelona are able to make the listener feel exuberant despite the fact that the concept of the album is rather depressive, centering around the faults and failings of an amateur Harry Houdini. The album reflects this conflict, sounding like the soundtrack to late night drinking in some jolly pub, with its well-timed celebratory moments mixed in with melancholy interludes. For drinkers and non-drinkers alike, I’m From Barcelona thoroughly entertain.